I haven’t been able to work on War Swarms recently. Another project has been demanding my time, and will continue to do so for the near future. I still have every intention of finishing War Swarms, but for now, things need to be put on pause. This is likely to be the last news post for a while, until I’m regularly putting time into War Swarms again. Thanks for understanding. I know this is not the news you wanted to read. Not the one I wanted to have to write, either. Sorry. This month, a lot of work went into making the game run faster. On the developer’s test machine, the game went from 50% idle CPU usage down to 10-15%. Lots of code improvements implemented here will also make it easier for the developer to add new content. This change is running now! The next combat unit is the Overlord. It commands and coordinates your other troops during battle, improving their health and attack power. The Overlord, and the next few combat zones where you’ll both fight against Overlords and unlock them for your own use, are ready - but they’re not yet visible. Their first appearance will be in War Swarms’ first temporary league. 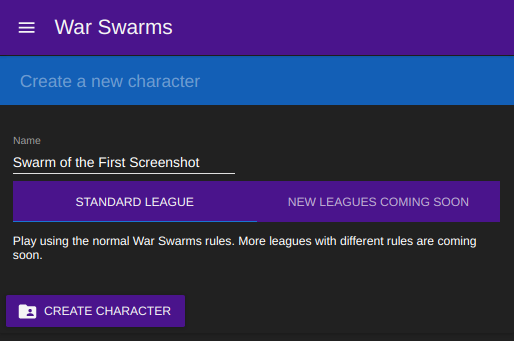 Once the league begins, create a new character/swarm and select the new league. Existing swarms cannot change their league - everyone starts from the beginning. Enjoy playing the new league, with its new features and empty leaderboards. When the temporary league ends - date to be announced; probably in about a month - its swarms will move to the permanent Standard League. Your progress during the temporary league will not be lost. If the developer feels the temporary league’s new rules/features went well, they’ll be permanently added to the game. After Overlord League ends, you’ll probably be able to build Overlords in the permanent Standard League and in all future temporary leagues. “Why?” Temporary leagues allow the developer to experiment with new features and game balance changes, with far less danger of a bad idea impacting your permanent characters’ progress. Temporary leagues also give everyone a fair chance at the leaderboards - whether you’ve played the game for three minutes or three years, everyone in a temporary league starts from the same place. Overlord League will begin 12/15/2017, 12:00:00 AM UTC - click for your time zone. Finally, the moment you’ve all been waiting for: at the time Overlord League starts, I’ll create a new post in /r/warswarms with some beta invites up for grabs. The game is still very incomplete, but temporary leagues are a big milestone, and I could use some more feedback. First come, first served; set your alarms now. I usually aim to make at least one news post a month. It’s typically at the start of each month, but there won’t be one at the start of January. Expect the next major news post to be mid-January; a short mid-December update might (or might not) happen too. Happy holidays! The “send feedback” button now looks like other buttons on the page. Each unit remembers its own input in the buy field when changing tabs. Previously, all units shared the same input. For example: buy 10 queens, then buy 100 drones, then select queens. There will now be a 10 in the queen’s input box; before this change there would’ve been a 100. Fixed a bug with unit purchases/cost calculations and combat. There were a number of symptoms fixed here, but the most obvious: you can now spend larvae immediately after your first combat win/first hatchery looted. The combat form now loads with your last zone selected. The game should now use much less CPU when left idle. Implemented zones 6 to 9 and the Overlord combat unit. Overlords improve your other soldiers’ hit points and attack power. Neither one is playable yet. Slower progress than I’d hoped this month, unfortunately: no new features yet. Since my last update a month ago, a known bug, which hadn’t caused much trouble before now, suddenly started to cause lots of trouble. It took a while to solve. Other behind-the-scenes stuff was happening too, and taken together, it delayed the plans I originally had for this month. I’ll be adding more types of soldiers beyond just swarmlings, the first temporary league, and several performance improvements, among other things. Many of you have been waiting for beta invitations. We’re getting closer - thanks for being so patient! There will be more news posts about beta invites this month. Fixed a crash when finishing combat without a chance to loot. Fixed a bug that displayed unit-counts and unit-production incorrectly. Fixed a display bug when deleting a character while disconnected. Fixed some issues with trailing slashes in urls. Fixed the button that shows/hides the left-side navbar on small screens and mobile. Added a big red error screen that should appear when something breaks. October 1st’s launch went very well. Expect to see new features launched this way in the future. That is, changelogs and version-number timing will not match new-feature-is-visible timing, since code will be written and deployed well before it’s actually visible. Your swarmling-queens, hatched outside of combat, produce swarmlings during combat. Every few seconds, your swarmlings attack the enemy. Destroy the enemy Lair to win! I’ve also worked on adding the infrastructure behind leagues. Leagues are periodic “seasons” that will have slightly different rules or new experimental features. Choose a league when starting a new character. October will open with the permanent Standard league. Expect temporary leagues to begin in November. When a temporary league ends, its rankings will be frozen and archived, and its characters will move to Standard league for further play. These changes, along with a few smaller features, will appear in the beta on October 1, when the new in-game countdown timer reaches zero. In October, I’ll be adding more types of soldiers beyond just swarmlings, the first temporary league, and several performance improvements, among other things. Firefox and Safari now work again. Oops. Added a countdown timer until the next release. Prepared a new character creation screen and league selection for release next month. Rankings now have nicer formatting. The character list is now sorted most-recently-played-first, not oldest-first. “Play” from the title screen now selects your last-played character, not your oldest. Deleting a character now also deletes its rankings. Hatcheries now show decimals for their production/sec, when needed. Prepared better unit visibility for release next month. Prepared a new combat system for release. It will be playable next month. During combat, swarmling-queens grow swarmlings over time, the same way drones grow meat. Swarmlings attack the enemy team every few seconds. Both teams begin combat with a lair. Destroy the enemy lair to win. Version numbers look different. Every release will now change the version number, even very small releases with no changelog. The “send feedback” form now includes version numbers.